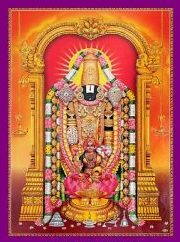 Please join us for “Sree Venkateswara Vratham (Monthly Puja)” at our residence, on Full Moon Day, Fri, April 19, 2019, 10:30 AM to 1:00 PM Eastern Time. Send an email to info@venkateswaravratham.org for the address details, after your RSVP is confirmed. We do not accept any gifts or donations. You may bring flowers or fruits or home cooked vegetarian food without onion and garlic, and offer it to the Lord. Thanks for your understanding. We totally understand that it’s difficult for children to concentrate for one hour during the Vratham. Families with children may plan on arriving between 11:15 to 11:30 AM Eastern Time.